Yep, that's right, I got a new car yesterday. It's a brand new 2009 with 4 miles on it. It has a couple of cool extras like satellite radio, keyless entry, 6 disc CD changer, power seats and it even came with an unlimited gas card. I walked into the dealership, signed the paperwork and was out of there. I got a great deal on the vehicle because I didn't have to pay a dime!!! For those of you that have been following the blog for awhile, you may or may not remember that I drive a company vehicle during the week and my personal vehicle after business hours and on weekends. My company policy is to replace all company vehicles once they hit 80,000 miles. My new vehicle was ordered a few months ago once I hit 77,000 miles and it arrived just in time. My odometer hit 80,000 as soon as I pulled into the dealership parking lot. It was so nice to be in the dealership and getting a new car without worrying about what my new car payment was going to be or how I was going to fit the new monthly payment in my budget. If you are currently making a car payment each month, make it a priority to get rid of it. When I paid off my car loan last May, it felt so good to be free of the monthly payment burden. Getting rid of debt can make you feel like a ton of bricks has been lifted off your shoulders. I'm enjoying the new car smell now because I don't plan on buying a new car with my own money anytime soon! congratulations! just be aware that the new car smell is actually toxic. Congrats on your free brand new car. When I read "unlimited gas card" I was droooooooooling with envy. Congrats on the new FREE car! how i wish i have company like yours! next month, is the last payment for my car! i already have plan to invest my money on a real estate property. Does your company cover gas & maintenance? I recently sold my car and went car-free. Not just because of car payments but all of the other things we pay for that go along with it. Even just the ability to go to the store easier and fit more stuff in the car. Good riddens! @Ryan: Yes, the company covers gas and maintenance. I'm assuming you bought a Ford, what kind? 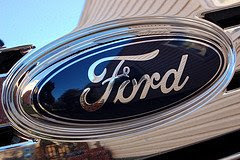 We love Fords and Mercurys, such nice, smooth rides! That's a great deal, having a company car. Commuting to and from work alone puts 200 miles a week on my car, and 400 on my spouse's car. I would not have car payments either, except last summer my neighbor's tree fell on my car! Totaled. Nice. I've never had a company car, but thought it would be cool. My father-in-law got a company car... and I remember how easy and pain-free it was for him. He's really enjoyed it. Even at present situation you bought a new car? Great news and congrates.